This week we pray through the Passion of Christ. This is the third phase of the Spiritual Exercises—the Third Week. In the Second Week, we asked for the grace to know Jesus more intimately, to love him more dearly, and to follow him more closely. This love leads us to be with Jesus in his suffering. The grace we seek this week is compassion. We reflect not merely on the physical pain he endured but also on the emotional, interior suffering of a person who is misunderstood, isolated, rejected, and alone. The colloquy is very important in the Third Week. We speak to Jesus as a friend would speak to a friend (SE 54). We speak words of sorrow, confusion, compassion, regret, fear, anticipation—whatever moves us. Or perhaps we are present to Jesus without words. In our prayer this week we personalize God’s saving activity: Jesus endures suffering for me. This focus is not meant to induce guilt and to inflict needless pain on us. Rather, Jesus’ offering is a sign of friendship with each of us, friendship that sacrifices for the other. In your prayer, you may find yourself drawn to contemplate your own trials or the suffering of others, whether family, friends, or strangers. This is natural. However, the point is not to become absorbed in our own hardships but to embrace them as a source of compassion for the suffering of others. Read Matthew 26:36-46 (agony in the garden). Keep your eyes and heart fixed on Jesus. Use your imagination to place yourself in the scene if you like. Note in these meditations how much Jesus’ opponents are concerned with self-seeking, face saving, and power tripping. Conversely, notice how Jesus refuses to play their games and instead remains true to who he is. Read Matthew 26:57-75 (night session of the Sanhedrin; Peter’s denials). In the Third Week of the Exercises, Ignatius invites us to consider how Jesus’ divinity “hides itself” (SE 196). We must not easily explain away the suffering we encounter. Jesus is not merely playacting his way through a passion play. We must take Jesus’ humanity seriously enough to realize just how much he loves us. He remains faithful to his Father and the mission of the kingdom and accepts the very real consequences of that faithful obedience, which he does out of great love. Read Matthew 27:26-31 (the crowning with thorns). Where is our God in suffering? We Christians do not have a fully satisfying explanation for why the world contains so much suffering. But we have something better: we have the power to deal with the suffering. We know where our God is during suffering. Our God is with us: with the Jewish boy on the gallows, with Ivan Ilyich in sickness, with Job in adversity, with Paul in weakness and persecution, with Jesus in crucifixion—with us in all the senseless accidents and ruptured relationships and interior brokenness of our lives. As you pray through the Passion and ask for the grace of compassion, consider how you are called to be more compassionate in the particulars of your own life. Ask: What invisible crosses do people bear? How can I help carry them? Who helps carry my own burdens? Who are the crucified peoples of our world today? “I ask for what I desire. Here it is what is proper for the Passion: sorrow with Christ in sorrow; a broken spirit with Christ so broken; tears; and interior suffering because of the great suffering which Christ endured for me” (SE 203). Read Luke 23:26-32 (the way of the cross). We will read Mark’s account of Jesus’ Passion over the next two days. Pray these Scriptures straight through or linger over them. 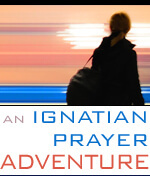 Use imaginative prayer to immerse yourself in these events. Pray the first half of the Passion, Mark 14:12-72. Pray the second half of the Passion, Mark 15:1-47. I put myself before Jesus Christ our Lord, present before me on the cross. I talk to him about how he creates because he loves and then he is born one like us out of love, so emptying himself as to pass from eternal life to death here in time, even death on a cross. By his response of love for God his Father, he dies for my sins. In the past, what response have I made to Christ? How do I respond to Christ now? What response should I make to Christ? As I look upon Jesus as he hangs upon the cross, I ponder whatever God may bring to my attention (SE 53). In this Holy Saturday moment, we wait in stillness, loss, and longing. Try to find stillness of soul today. Read Luke 23:50-56 (Jesus is laid in the tomb). Read Philippians 2:1-11 (one of the most ancient hymns to Jesus Christ in the Bible).